I took a short silk painting workshop in Puerto Vallarta with a woman named Carol Anne, who owns the http://www.oopsperfect.com art studio. Besides loving her to bits, I loved taking her course. 1. One starts with a long, hemmed oblong piece of white silk. Draw on the silk with a water soluble dressmaker’s pen. 2. Cover the lines with a dye resistant, thick liquid called gutta. The gutta remains on the silk, and it comes in a wide variety of colours. Let dry. 3. Brush in your colours of dye carefully between the lines letting the dye run up to the resist. 4. Let dry. Wash. Iron. While walking into town one morning, I had to stop and ask a woman where she had bought her hat. Bright pink. But she looked so fabulous in it. She actually crocheted it herself so the next day I plopped down $30 and had one of my very own. You know the rest of the story, I bet. I tried to figure out how she had made it and eventually between her hat, my minimal crochet experience, and the internet, http://www.youtube.com/watch?v=TuhEaWnqRzw, I came up with a rather sweet version myself. I’ve been on my usual manic streak and made several for friends. 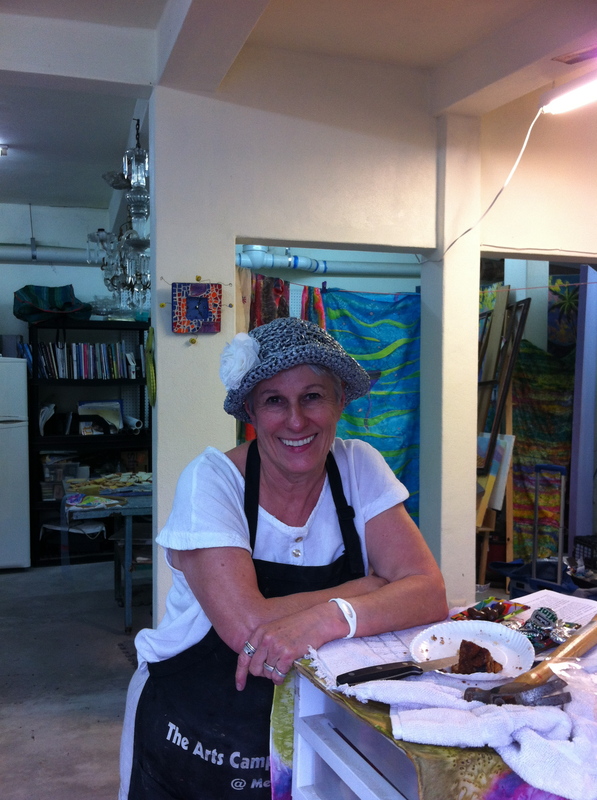 This pic is of my art instructor, Carol Anne, wearing hers. She is the woman who walked me through a fabulous silk painting workshop.